This recipe marks the start of a new trend here at PaleoPot. This is a recipe concept, complete with suggestions for how to finish it off to your liking. Face it, we don’t always follow a recipe we find online down to the letter. It’s normal to have different preferences, while the important thing is the concept that helps you bring real food to your table. Today you will learn how to make a super easy paleo butternut squash soup, along with four different flavor suggestions that may just increase your odds of actually making it. 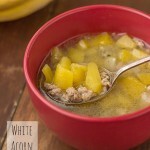 If you do make this, you’ll never buy that squash soup in a box stuff ever again. I promise. 1 large butternut squash, peeled, seeded, and cubed. This should result in about 6 cups of squash. If you are one of those folks that buys the precut veggies, you will likely need 2 packages. My large squash that weighed just over 3 pounds ended up yielding just over 6 cups of cubes. 1 can of coconut milk (14 ounces). I used TJ’s light coconut milk yet a “full fat” brand will result in a creamier end product. 2 cups of chicken stock. Don’t feel guilty if you don’t make your own, but you should! 1 granny smith apple, peeled, cored, and cubed. 2 medium to large carrots, peeled and chopped into small pieces. That is your core recipe! Notice there are no seasoning or special flavors added. We’ll get there soon. The point is that for one large squash you need a can of coconut mik, some chicken stock, an apple, and a couple of carrots to help make the color pop! With this basic recipe you now have the template for making an array of super easy and super awesome butternut squash soups! I wish there was more magic to it than this, yet it really is this easy. Oh and since we’re talking concepts, 4 to 6 hours on your low setting will get it done. After that you just need to stick your immersion blender in your crock pot for a minute and puree that goodness up. Oh you don’t have an immersion blender? Well, I guess you’ll just have to get your food processor or blender dirty. These recipes should yield you just over 2 quarts of soup. 1 can (14 ounces) coconut milk. 6 carrots, peeled and chopped. 1 cup of raw cashews, chopped. 1″ piece of ginger, grated. 2 cups of apple cider. 2 apples of your choice, peeled, cored, and cubed. 1 tsp of ground nutmeg. 2 heaping tbsp of red curry paste. 6 cloves of garlic, chopped. 2 jalapeno peppers, chopped. Remove the seeds if you desire less heat. 6 ounces of crisped bacon, chopped. 2 tsp of Spanish smoked paprika. All recipes are to be cooked on low heat for 4 to 6 hours. Blend or puree when cooking is finished. That’s it. An immersion blender is ideal for this. If you don’t have one, let your mix cool before transferring it to a blender or food processor. Garnish with anything from cinnamon and nutmeg, to curry powder, pumpkin seeds, and of course bacon. Technically that is five varieties of soup, not counting the simple base recipe concept. I hope some of you will whip up your own creations based off of the base recipe, and of course share it with us in the comments below. Enjoy! Have this cooking in the crockpot now- added some green onion to it and instead of a granny smith I used 2 small fuji apples. Can’t wait to taste it! Yum! I made the apple cider variety and it turned out so good. Perfect for the first rainy day of fall. Thanks for the ideas! Glad you enjoyed it! Thanks for the kind words. I’m making the bacon jalapeño version today. Thanks for all of the variations! Excited to try them all. A simple suggestion for fast lunch leftovers: shred up leftover chicken & pour your leftover soup (any of the versions above) on top. Heat & eat. Going to try the Ginger recipe tomorrow. 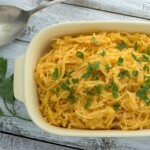 Thank you for such a versatile reminder of easy ways to fix Butternut Squash! This is exactly what I had in mind, plus I was thinking of adding some not pureed veggies as well – more like using the base soup as my binder if you will ….. a great lunch idea for work and a great way to get my daily serving of healthy veggies! Yum! Can’t wait to try this out! I had paleo butternut squash soup at a dinner party a couple weeks ago and it totally satisfied my craving for baked potato soup (especially since we topped it with bacon and chives!). Can you taste the coconut from the milk? Wanted to try this recipe out for a Thanksgiving appetizer but we don’t have a lot of coconut lovers here. Thanks. I’m fairly confident that nobody will taste the coconut milk, especially with the flavored varieties. I say go for it. trying Jalapeno and bacon right now! Using the auto shift setting, hopefully it will work…wondering do I add the crisp bacon now or is it for use as a garnish? Talk about spur of the moment! I hope you see this soon! Thank you. Hey Beth, sorry if my instructions were not clear enough. 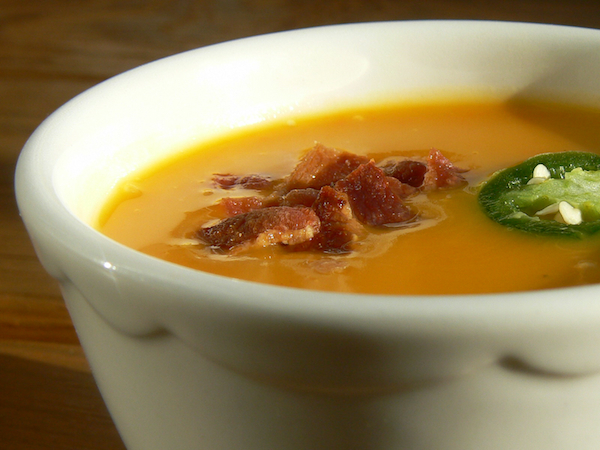 I added the crisped bacon to the soup for cooking. Using it as a garnish as well… hard to go wrong there! Hope you enjoyed it, do let me know. This sounds delicious! Just one question… can I substitute something else for the coconut milk? I made the traditional version which turned out nice but it took 8 or so hours, so missed the dinner cutoff time. We are going to use it next day. Could be our slow cooker is slower cooker. I just made this, but accidentally cooked it on high. After a couple hours it was ready! I added cilantro, jalapeno and avocado to my bowl as garnishes (since my husband prefers it plain.) Thanks for a great recipe. Thank you for taking the time to write! Cilantro sounds like a nice touch for a garnish, thanks for the suggestion. I made the bacon, jalapeno last night. It was delicious. I didn’t bother blending the soup afterwards. I like the texture of chunks in my soup. I mashed it up a bit, but left it thick. It was very good. I am just about to turn the crockpot on to prepare the Apple Cider Spice version, but I just realized that I am not clear on one thing: The ingredients for the variations are In Addition to the core recipe? For example, the core recipe call for two cups of stock, and the variation calls for two cups of cider. Is that in place of the stock or in addition to it? I appreciate any response–I have all the ingredients in the crockpot right now staring at me and I’m drooling to taste the finished dish! Just follow the apple cider spice recipe as listed. It substitutes the basic version’s chicken stock with apple cider. Sorry about the confusion. I made the Thai curry version last night but it was SO hot I made another batch to try and temper the heat and it still didn’t work. Did anyone else have this experience? I don’t picture myself a lightweight when it comes to heat. I wonder if the Thai red curry paste I bought was especially spicy? I bought it at a local Thai market and have used it before. Sounds like you got some good authentic Thai paste! Most US brands are not as hot. I love the heat though! I’ve got this in my crockpot now. I did the base version and just mixed up the spices a little. I used 1 tsp Garam Masala, 1 tsp cinnamon, a dash of garlic powder and a little salt and ground black pepper. I can’t wait! 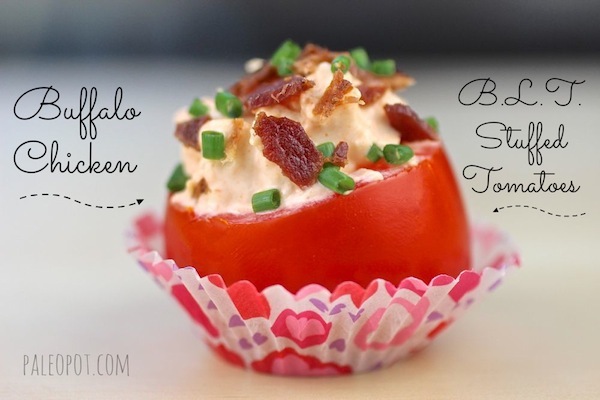 Im making the bacon jalapeno version tonight, just got one question, do you add the coconut milk to the slow cooker to cook with all the other ingredients, or add at the end just before blending? Add it in to cook with all of the other ingredients. I am making this for the second time in less than a week it was such a hit. I made the basic version the first time and it was delicious! I wanted a little heat and family members didn’t, so I added spicy peppers to mine as garnish. This time I am making the basic version again with onions and adding a little bit of Goya Adobo with Pepper (gluten free of course) for a little more flavor. It’s going to be perfect for the frozen rain weather we’re having at the moment. 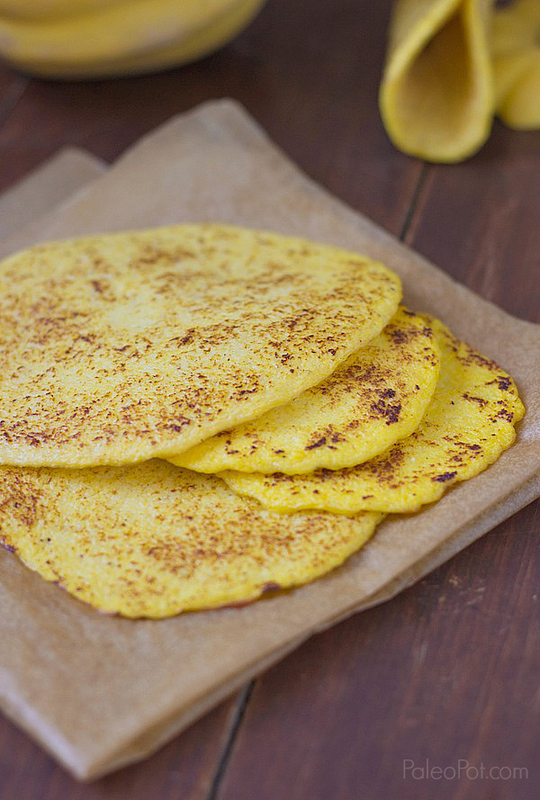 Thanks for such a great and versatile recipe! I just made the Thai Curry version of this soup. OMG. It’s to die for! Having a teensy bowl as an afternoon snack and can’t wait to enjoy more for dinner – – after my Crossfit workout! I made a double recipe because my squash was large. Do you think I could freeze half? I made the traditional version. I used baby carrots and cooked for 6 hours. The carrots were still not cooked enough to mash. Also mine turned out dark brown due to the cinnamon and nutmeg. Are you sure about the 1 tbsp each. I did not even put that much and thought the cinnamon taste was too overwhelming. The previous poster, Jason, actually used three times as much spice as the recipe calls for, right? He said Tablespoon and the recipe says teaspoon. I was wondering, could this be prepared raw and blended in a good blender to achieve good results? When I told hubby we needed an immersion blender, he told me I should have just put the ingredients in our blender. Has anyone tried that? Thanks. Yes, a tablespoon is 3 teaspoons. Also, an immersion blender is simply a way of blending that saves time and cleanup, you can use a standard blender and achieve the same results. Just blend a little and then check your consistency, you can always blend more yet you cannot un-blend. I did this too and it added some flavor. Thanks for the suggestion! I’m going to try the traditional version today, and am thinking of adding lentils. Do you have any suggestions if I were to do so? Thank you!! Sorry, I not not eat or cook beans (lentils) at all. I made the carrot cashew version. I used Almond milk instead of cocunut milk and it was really good! How well will these soups freeze? I haven’t tried yet in all honesty, anyone else have any luck? I made the bacon jalapeño version and frankly, I was really disappointed . It has a funny taste. I can’t quite put my finger on….almost like a raw funny taste. I don’t mix veggies and fruit so I omitted the apple. Seems like it might be better using the bacon as a garnish. Does smoky paprika have a funny flavor? Sorry to hear this Peggy. This recipe is one I get a lot of rave reviews with. Smoked paprika should have a smell sort of like a cousin of bacon, definitely a smoked wood smell, and it imparts a similar taste. I have never omitted the apple from this like you did, so perhaps the answer lies there in conjunction with the seasonal bitterness of your squash? Do you add the Apple to the curry recepie? It isn’t listed. For the bacon jalapeño recipe, do you need to use smoked paprika? I just don’t feel like spending $10 for 2 tbs and have regular at home. Thanks! Yes regular paprika will suffice, yet it is 2 teaspoons, not tablespoons to clarify. Nancy, you should spring for the smoked paprika! It is so yummy. I use it as a secret ingredient for many things. I tried the Thai Curry recipe. I did not have the exact ingredients, so like someone else, I substituted the Granny Smith with two small Fuji apples. Had Green Thai Curry Past, instead of red. I also added some extra ground lemongrass. The soup was AMAZING! Thank you so much for submitting these recipes. Will definitely use it again! Trader Joe’s has a Butternut squash soup already made. 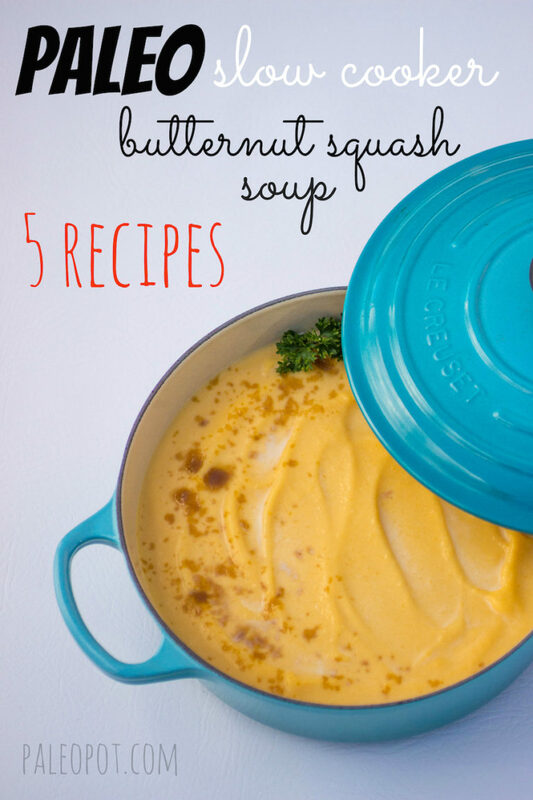 If I was to use that as the base, would I just eliminate the butternut squash and coconut milk from the recipe? Thanks!! These recipes sound amazing! I could not recommend using a pre-made soup to replace the butternut, I doubt it would work out at all. Sorry! 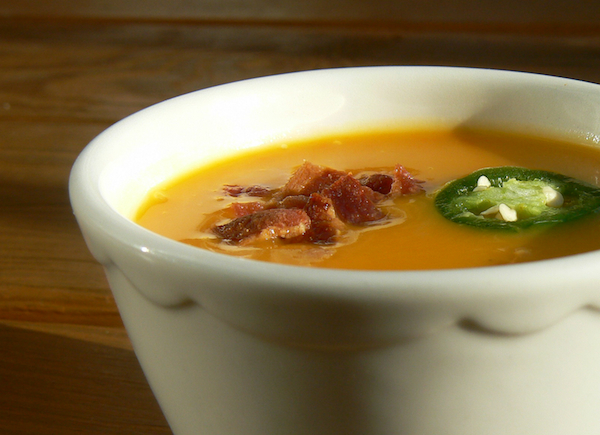 The Bacon Jalapeno has to be the very best soup I have ever tasted! I am so in love with this recipe. Made it for the first time a few days ago, and am now making a double batch so I can share it with my coworkers (since I’ve been bragging about it for the past 3 days..lol). Have you made this in an instant pot? If so, how long did you cook it.